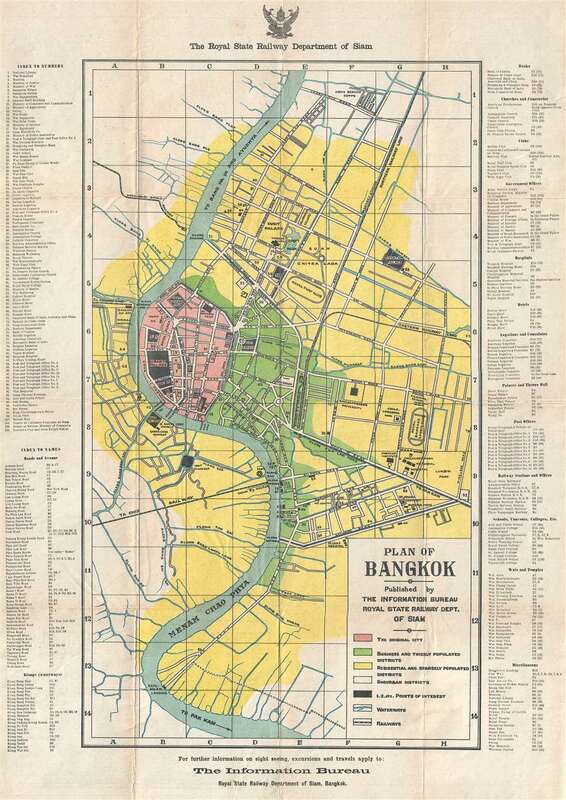 A colorful and detailed city map of Bangkok published by the government railway department. This is a c. 1920 Thai issue Royal State Railway Department of Siam city map or plan of Bangkok, Thailand. The map depicts the city from the Bangkok Noi Station to the Royal Bangkok Sports Club and from Tejavanij Road to the Chao Phraya River. Created by the government railway department, four different railways are illustrated here. The Paknam Railway, Thailand's first railway, was established in 1893 and runs southeast from the main train station. The Northern and Eastern Railways run to the north from the same railway station, before the eastern line turns east. The Ta Chin Railway, today known as the Maeklong Railway, leaves the city from the Ta Chin Railway Station on the west side of the Chao Phraya and heads southwest. The Southern Railway leaves the city from Bangkok Noi Station on the west side of the river from the city center and heads due west. Numerous locations throughout the city are labeled, including the grand palace, the Pasteur Institue, Chulalongkorn University, and the Phyathai Palace. One hundred and three other locations are identified numerically and correspond with two different indexes included along the borders. The first, along the left border, lists these locations numerically, making it easier to find a location after locating a number on the map. The other index, split between the left and right borders, lists streets and klongs (waterways) alphabetically, and the numerically identified locations by category, such as banks, hotels, consulates and legations, post offices, and railway stations. This map was published by the Royal State Railway Department of Siam in the 1920s. We have been able to locate two other examples in institutional collections, but no other examples that have become available on the private market, making this a rare find of one of the world's wonderful cities. Very good. Even overall toning. Verso repairs at fold intersections and to fold separations. Wear along original fold lines. Blank on verso.